Martha had a home in Bethany near Jerusalem and it was here that Jesus often rested and visited. Her brother and sister--Lazarus and Mary--are regularly mentioned with her. Often, the story that we remember of them is when Jesus visited and Martha was busy preparing and working to provide for Jesus. Her sister, Mary, was sitting at Jesus' feet.Martha chided Mary about not helping and Jesus corrected Martha saying that Mary had chosen correctly by being present with him. It's a popular scene for sermons and stories and, yet, it is not the only place we see Martha--whom Jesus loved. Mary and Martha had sent word to their friend Jesus that Lazarus was sick and likely to die. They expected him to come quickly because of his dying friend and provide the healing that they had seen with their own eyes. At first, their anxiety was high but their hope remained fixed on Jesus' intervention. They had seen him heal strangers so, surely, he would heal a dear friend like Lazarus. Yet, he did not come immediately. Instead, he waited and conversed with his disciples. He took the moment to teach those close to him even if it involved anxiety and pain. As the days passed, hope dwindled and confusion reigned in the minds of those close to Jesus. Martha must have wondered why Jesus delayed. Every passing traveler must have attracted her attention even as she cared for and served her brother. Finally, Lazarus died and with him Martha's hope. They buried him, they mourned him, and they wondered what could possibly have kept Jesus. They gave up hope. They wondered if Jesus had been waylaid by bandits. They wondered if Jesus had forgotten them.Martha--whom Jesus loved--was forced to deal with the anxiety and pain of the cold grip of grief. Finally, Jesus arrived at the entrance to their land and somebody told Martha that he had come. She left her family and friends and ran out to meet him. 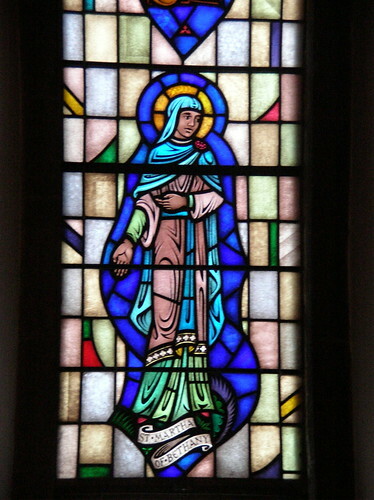 Mary remained with the mourners. Who can know what thoughts flew through Martha's head as she ran? When she met him, she lamented: "Lord, if you had been here, Lazarus wouldn't have died. "Feeling a faint glimmer of hope that begged to be believed in but demanded to be doubted she continued, "But, even now, I know that you can do anything..." Perhaps, she was just telling him that she still loved and trusted him even if he had let her down. Perhaps, she was asking for a miracle. And yet, perhaps, she didn't really know why she was saying it except that she had faith in this Jesus whom she loved--and whom loved her. She was asking for permission to hope. "Lazarus will rise again," he said. Martha, not wanting to fan the flames of hope if they would only die away again, replied, "Of course... on the last day--in the great resurrection." Martha had grown used to the saccharine sweet words of the mourners and friends who comforted her with anxious phrases.They saw her hopelessness and offered sickly assurance to replace it. She thought that Jesus was offering bland support because he didn't know what else to say. Instead, Jesus said something shocking: "I am the resurrection. I am life. Whoever trusts me will live, even though they die. Death is not the end of all things for those who trust in me--I am life itself and I shall conquer death." Having said this, he asked her, "Do you trust me?" Martha looked into his eyes and knew that hope and trust placed in this man--Jesus--is not misplaced. She replied, "Yes, Lord, I trust you. You are the Messiah. You are the Son of God.You are what happens when life takes a body." In the story, Jesus goes to the tomb and calls Lazarus out of death. Jesus defies the powers of the world that say that death is the end and the ultimate threat. Instead, Jesus shows that those who place their trust and hope in the incarnation of life have nothing to fear in death. Jesus defied the hope-killers by offering life even in the presence of death. Lazarus comes out of the tomb and continues to live. This is an amazing scene but it is not the only amazing scene in the text. Before Jesus raises Lazarus from out of death, Jesus resurrected Martha's hope by assuring her that death is not the end and is not insurmountable--a point he would make again through his crucifixion. Jesus gave hope back to Martha and this is, perhaps, as amazing of a miracle as the raising of Lazarus from the dead.